nstead of dunking your chicken wings into a rich blue cheese sauce, how about you start dunking some hoops? Basketball is a great game to get some competition going between the guys. It’s also a great form of exercise and a way to have fun with the kids. There are lots of reasons to get a basketball hoop. However, there are even more benefits and reasons to look into adjustable and portable basketball hoops for the outdoors. We’ve done some research on your behalf to make sure you don’t end up with an airball of a basketball hoop purchase. We’d had to Kwame Brown this up and show you a low-quality basketball hoop. No one wants one that crashes to the ground with every gust of wind, bank shot, and slam dunk. Poor quality portable basketball hoops don’t just interfere with the play and prevent you performing your wicked moves. Rather, they can also be extremely dangerous, especially around the little ones. To make your search even easier, we’ve been playing basketball all week, well sort of. What is “playing” if you don’t miss a lot while yelling “make it rain!” right? In this time, however, we found the best adjustable and portable basketball hoops on the market. Want to see what we’ve got in store for you? We first need to go through a triangle offense to help people defend themselves best with some FAQs first. If need be, you could pull up from halfcourt like Steph Curry and go straight to the hoops. It’s up to you. Although unlike Curry, you may need to know a bit about these as well. Go for the layup this time. What Are The Benefits Of Buying Outdoor Adjustable & Portable Basketball Hoops? You might have come here already being sold on the idea of a portable and adjustable basketball hoop. That’s great and you’re a smart guy. For the other smart guys who are yet to realize all the benefits of owning one of these types of basketball hoops, come close. It’s likely the best way to discuss this would be to discuss normal versus portable. Having your own basketball hoop is great. If you head down to your local street court, you’re likely to find the hoops are already in use due to the popularity of basketball. You may find a group of teenagers up to no good – maybe causing trouble in the neighborhood. We just warn you not to get in a fight and scare your mother. These same people, whom we call “court-hogs,” seem to state ownership of these local amenities. They then use them for hours and hours of each day. This means you perhaps some of your friends joining in are left to play other things that you and they don’t always want to. If you own your own basketball hoop then this isn’t an issue. It’s yours to enjoy whenever and wherever you want. No need to race to the court early morning or before the school bell goes. Your hoop is always awaiting your dodgy shots and cringy celebrations. Many have them in their driveway or backyard. However, not all are mobile or adjustable. This is an issue, as it takes away from the user experience you might need from one. Having a portable basketball hoop means you can enjoy it wherever you want. You’re also able to make your own user experience out of it. 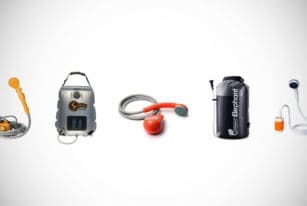 You can take it to the park, the beach, a picnic, or a friend’s barbeque. It can even be moved around your own premises to escape the beating sun and your neighbor’s windows. If people come around to visit there might be more cars on your driveway, which means you could hit cars accidentally. That’s not an issue with portable basketball hoops, because you just roll it elsewhere to keep the game going. Adjustable basketball hoops fall in this same category of useful things to have. Their real attraction is the ability to adjust their height. This will allow younger and/or shorter people to have a better way to play. However, some of these may be harder to move. This is the only drawback. The sport of basketball is great to introduce kids to. The game can teach proper sportsmanship, motor skills, competitive nature, and team mentalities. It’s also a great way to bond with a kid. However, height can make them feel odd so having it be adjustable is terrific. When you’re on your own you can increase the height again. It’s a toy for them but it’s also a toy for you without them knowing. Merry Christmas to both! There are many other benefits to getting off the recliner and shooting some hoops with your pals. You didn’t come here for a lecture, but the benefits of these basketball hoops being portable and adjustable in height are good to know. They’re cool products, right? Now, are you wanting to play? What Are The Main Things To Consider When Buying An Adjustable & Portable Basketball Hoop? Before you get ahead of yourself and choose a portable and adjustable basketball hoop you’ll regret, it’s important to consider your purchase wisely. Not everyone wants to buy portable basketball hoops for the same reasons. What’s one man’s perfect product may not be yours. Playing level of who will be playing happens to be drastically important. You and your boys may also play in a league at a high standard. If this is the case, you need a basketball hoop that’s of that same standard. You’ll need one that adjusts to the standard playing height and one that is going to allow you to practice all your shots without issues, including slam dunks. However, you and the boys may only want something to do at halftime during a real game. If that is what you’re looking for then you’re not going to need to splurge on some regulated-height basketball hoop. A question you’ll need an answer to is simple, who are the players? To add another, who is on your team? These questions are for different reasons, but both are crucial. If you have kids and this is your present disguised to them and your wife as their present, then you’ll still have to accommodate their uses. If your young ones really are young, then you’ll need one that decreases to a playable height. Give yourself some chance of bringing up an NBA superstar and don’t give the game away! The level of a basketball hoop’s portability is extremely important in this case. First of all, you need to check the obvious features that make it transportable. Wheels likely give that away. 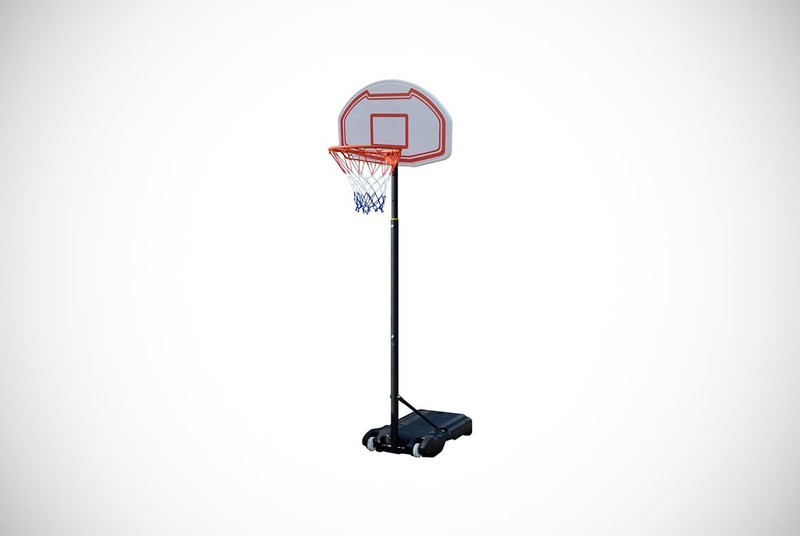 Thankfully, all of the adjustable basketball hoops on our shortlist below have wheels secured. Add this to your checklist if you decide to hunt elsewhere. The second design feature to look for is any other portable-type aids. Some models have a specific design to help you roll the product. There are several other types, as you’ll see below. You’ll also need to know the average number of people it takes to transport the basketball hoop. Most of these can be transported by one person. However, some higher quality and/or heavier ones may require a second person or possibly more. If you want to practice alone then make sure you get a high-quality hoop set-up that can be taken from one place to another by yourself. If product descriptions don’t say this directly, make sure you take a look at their weight. The bases usually can be filled with sand or water to stabilize them. Meaning you can remove this if the weight is too heavy then simply refill it when you get it set up. On Average, How Big Are Basketball Hoops? The standard size of a basketball hoop is ten-feet high. By standard size, we’re referring to the regulated size that the professional players use. As you know, the basketball hoops we’re going over are all adjustable in height Some of them can reach the standard heights but some aren’t quite as tall. In terms of the backboard, the regulated height is 42 inches tall. Again, some of these portable basketball hoops reach these measurements while the smaller ones don’t. This is common more so for the less expensive models or those made for “youth” types. If you see the “youth” tag in the name, it’s a safe bet it possibly will miss regulation sizing. Most often you’ll find the tallest ones also have the biggest backboards as well. How Easy Is It To Set Up And Install Basketball Hoops? Due to the size of these products, they don’t come assembled. You’re going to have to dig out your tools and get to work. The good news is that you’ll probably only have to do it once because they can be left outside in most weather conditions. The basketball hoops will come with instructions to make your job easy. If you can follow instructions and there are no manufacturing defects, there should be no issues. The average time to set them up is between one and two hours. Once you have it set up and standing there’s only one thing left to do – add weight. Keeping it secured to the floor is important and usually done with water or sand. You’ll find holes to add the water or sand right at the base of the product. However, some people have complained that these holes tend to be too small. In these situations, it’s better to find a funnel so you fill it up more efficiently. Sports God is quite a name for a brand of portable basketball hoops. With this name, expectations have just skyrocketed! Thankfully, they have a slam dunk on their hands. This product comes in a choice of red or black. This predominantly refers to the backboard, but the color can be confusing. This backboard is made from a sturdy and high-density polyethylene and withstands corrosion impeccably. The base is made of the same material. It’s safe as well, proven by its BSCI certification. It can be adjusted between 5.6 and 7 feet so you can play with Tiny Tim, your other pals, and even have fun with the kids. 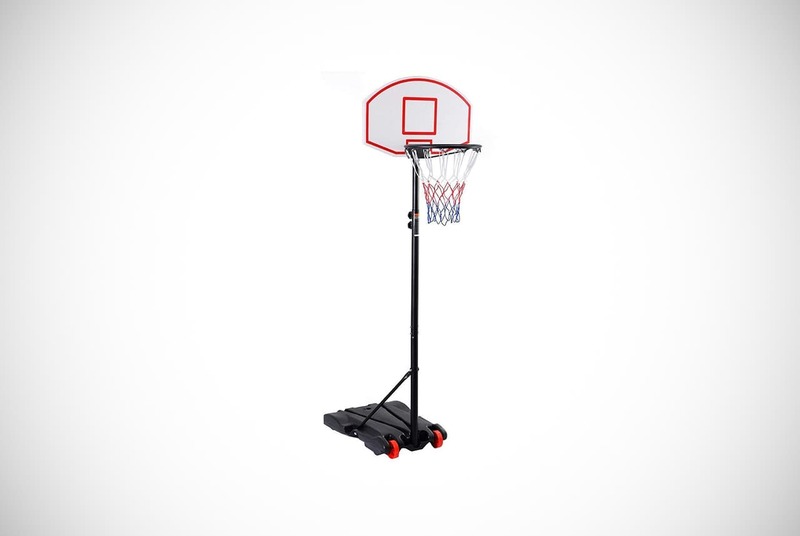 These portable basketball hoops are quite versatile, proven by its standard basket size to cater for full-size & smaller basketballs. It’s also fully adjustable to bring down too. It is perfectly designed to make it exceptionally durable. The main pole running down the middle of the product is made from strong steel. The net is made from extra-thick nylon that provides quality. It’s also protected against the sun and is fillable with 75 pounds of sand or 65 pounds of water to keep it stable. It has wheels and pulleys to make getting it from A to B seamlessly in transport. All you have to do is tilt the product forward slightly and start walking with it – no stress and no backache. Silverback provides our next portable basketball hoops. It’s a bit more expensive, but you’ll see why. You can get this model with a 50- or 54-inch backboard, with Silverback offering these backboard options over color options. However, you have to pay for a few more inches. The Silverback brand put extra thought into improving their design by making an interestingly shaped base, improving stability. This continues in the pole, which is slanted to improve weight distribution. This then connects to a steel frame, linking the structure at the base. This is a tall version, capable of adjusting from 7.5 to 10 feet in increments of only 6 inches. Thus keeping kids involved. You can transport the basketball hoop to the park or even the neighbor’s house easily with its wheelbarrow design. This allows you to lift and roll it to where it needs to be. Although, it’s heavy and will require two people to move it. Other cool things to take note of is its exceptionally quick 90-minute set-up time. It also has a base drain that allows you to empty the water without a struggle. Seatopia and their Basketball Hoop System are being subbed in here. Don’t let their name confuse you, this hoop for a swimming pool. This is also a wallet-friendly option! You can adjust the main pole so its height stands between 5.73 and 6.87 feet. This makes it one of the smallest basketball hoops on our list. 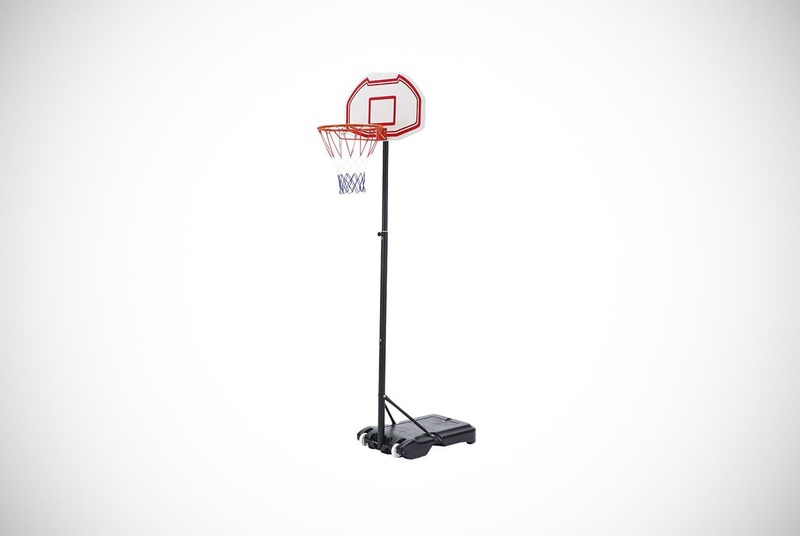 We don’t believe this takes the fun away too much as you can easily make a get-together more enjoyable with these portable basketball hoops. The backboard is also a little smaller at 28 inches wide and just under 18 inches tall. To be fair, it would be a little silly of them to add a huge backboard to their smaller design. The other half of its key features is that it can be transported effortlessly with its attached wheels. It’s been designed to ensure you get to enjoy playing for a long time. The main components of the structure are made from heavy-duty stainless steel to stand strong in heavy rain and wind. The base holds up to 9.53 gallons of sand or water to keep it from moving when you place it somewhere. The backboard is made from rigid polyethylene with the net being made with nylon one. Both will work in the elements and hold up well over long-term use, making it a perfect outdoor goal. 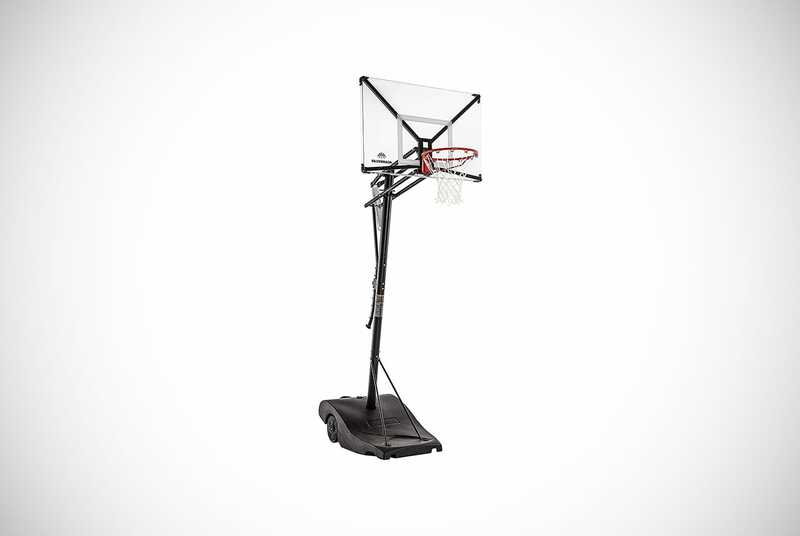 Lifetime offers spectacular portable basketball hoops. This particular design comes in many colors, including red, blue, dark blue, gray, red, and white. Their design has the common, yet reliable telescoping pole. This means you can adjust the height of the product in increments of 6 inches between 7.5 and 10 feet. This is the same height as some products double its price. The three-piece pole is made with steel and added with a powder coating to withstand erosion and reduce daily wear and tear. The net sits below an all-weather classic rim that makes it perfect for outdoor use all year round. Other pieces of manufacturing genius are the inclusion of a large and durable shatterproof backboard, with graphics that won’t fade easily. All of this is made stable thanks to a heavy-duty base that uses water or sand. Be sure to remove this before the winter, or it can be a huge issue. 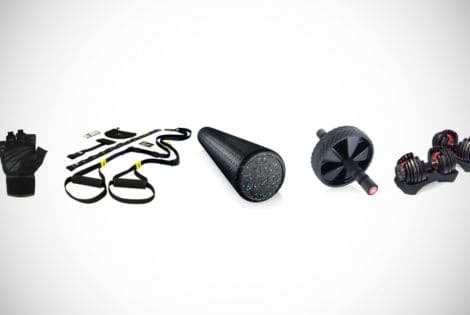 Lifetime has added weight-bearing wheels to tackle different terrains and slopes while you move the hoop. The brand feels their product is built to last, quintupling down by adding a five-year warranty. This surely is great for the money asked of it. Spalding is a massive brand in basketball, having put out all kinds of basketball-related products for over a century. They’re certainly a brand you can trust. This particular design comes in black and white with NBA branding on the backboard. The backboard can be purchased in two sizes. You can rebound shots off a 45-inch acrylic surface or set up your buddy’s slam dunk with a 60-inch board. The adjustability of this model outshines the other designs to get an extra nod of approval from us. It equals some of the more versatile basketball hoops by adjusting between 7.5 and 10 feet. However, unlike others, this can be increased or decreased at any measurement you prefer. This lets you tailor the height to accommodate your abilities rather than making it slightly too easy or difficult. Spalding removed the telescoping pole system and swapped it for a screw jack lifting system, allowing the extreme adjustability. These portable basketball hoops have a 3.5-inch steel frame capable of withstanding even the most aggressive play and weather. Spalding’s also includes its trademark Arena Slam Breakaway Rim. It’s unarguably portable due to its wheels, allowing it to portable in spite of the 100lbs weight from its durable and robust material. Once you’ve found the perfect place for it, you can add up to 40 gallons of water or sand to ensure stability and safety. What size headboard would you get? One of the best adjustable and portable basketball hoops on the market today come from Giantex with this creation above. This is another smaller and cheaper basketball hoop. 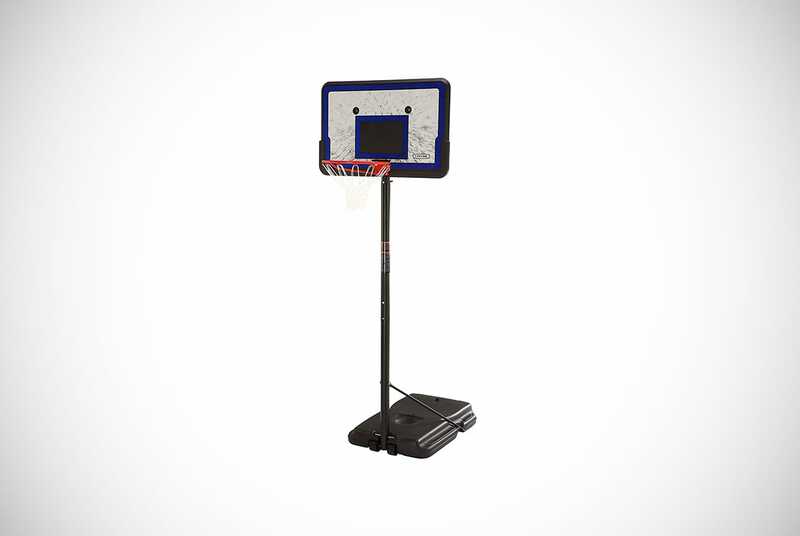 If you’re looking for a first basketball hoop for the kids at a great price, this is perfect. You can adjust its height between 5.5 and 6.10 feet. This lets you match it to your kid’s height or adjust it depending on how many beers you and the boys have already had. It has a steel frame to keep it sturdy and other elements are made from widely-used polyethylene. Add the heavy-duty base to store your 55 pounds of water or 65 pounds of sand and this makes for a quality product. Unlike poorly made designs of the same size, this will not spend half of its time on the floor. Assembling it will take a little while but the end result will be more than worth it. Don’t worry, because all hardware will be supplied for your convenience. Once you’ve got it up and ready, you can easily transport it on your own from the garage, to the garden, and to the park with rolling wheels. We know we’re supposed to be featuring outdoor versions but these portable basketball hoops could even be used indoors. That’s if you can convince your wife that’s a good idea – good luck, pal! 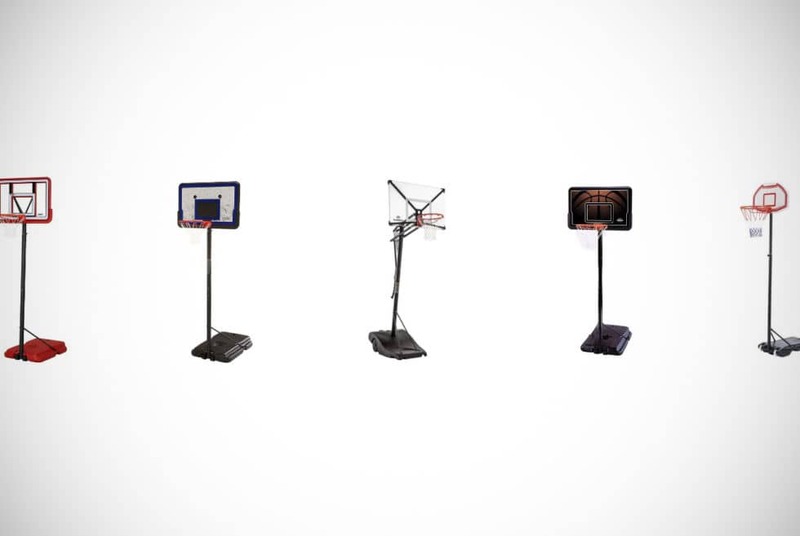 The Lifetime brand is back with impressive portable basketball hoops once again! They include their normal five-year warranty, making it known right off. The design includes a powder-coated steel telescoping pole that allows height to be adjusted from 7.5 to 10 feet in six-inch increments. The pole itself is incredibly sturdy, allowing it to handle major dunks. The backboard is 44-inches wide. Lifetime even claims it’s virtually unbreakable, so perhaps you want to test this. To be fair, Lifetime may have the “virtually” line in there due to rogue Shaquille O’Neal attacks. Just below the backboard is an 18-inch solid black rim with 0.5-inch braces, both made of steel. The base holds 27 gallons of sand or water and includes wheels to enable you to roll it to your preferred location. The only negative is the filling holes are a little on the small side, which makes getting it set up more time-consuming. 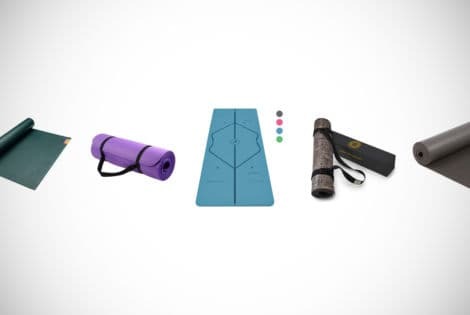 All of these materials are weather resistant to keep rain, wind, snow, hail, and sleet at bay. For the quality on offer, this is a cheaper option. 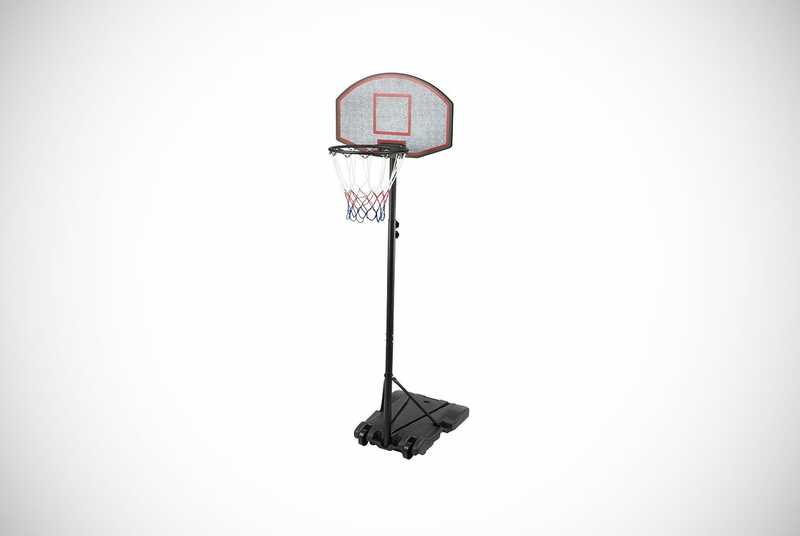 Ultimately, it’s perfect for those looking for regulated height and exceptionally portable basketball hoops! The Benlet Portable Basketball Hoops are the next product we’d like you to know about. They offer their cheaper basketball hoop in two different color options. One is a white backboard with red lines and the other has a black backboard with a yellow-striped design. They both have the traditional tri-colored net in red, white, and blue. God bless America! It has shorter height adjustability between 6.9 and 8 feet, but it’s still perfect for you and the future Men’s Gear readers. 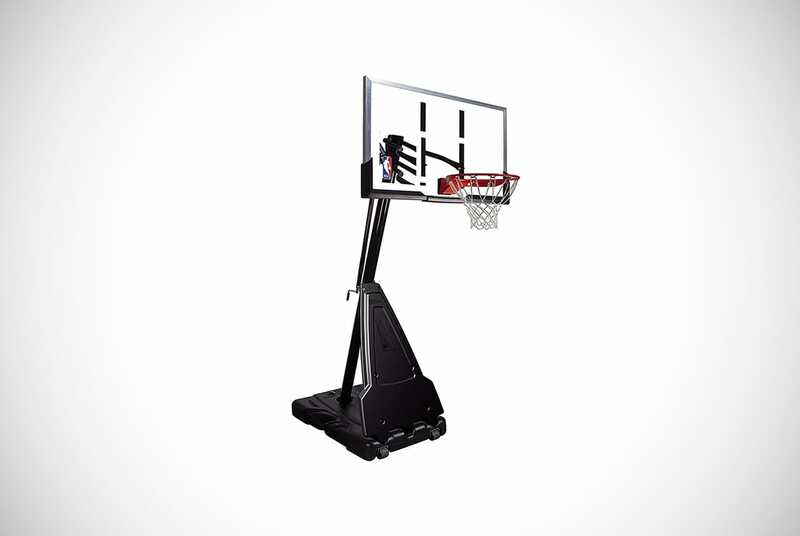 You can place these adjustable and portable basketball hoops inside or outside your home. Getting it back and forth is made incredibly easy with the attached and reliable wheels. These wheels can take on difficult terrains and uneven surfaces so you’ll never be left stranded. Wherever you place the product it will be made safe and secure by filling the cleverly-designed base with either 60 kilograms (132 pounds) of sand or 35 kilograms (77 pounds) of water. Although, we’re not sure if these are the exact numbers due to Benlet’s issue with over-thinking numbers. Just don’t mix them together or your Benlet Portable Basketball Hoop might not be so portable anymore. The penultimate adjustable and portable basketball hoops come from Vogvigo. You can get their design in a clear backboard or a black and blue one. Both backboards are 44-inches wide. You can also choose a PVC or HDPE backboard as well. Note, the PVC version is much more expensive. There is a spring attached to the hoop to bounce back after you make your shot. 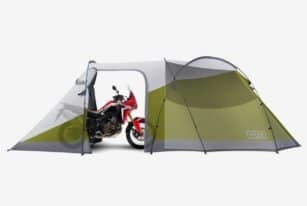 The hoop has a nylon net attached so you can leave the product outdoors in any month, no matter how extreme the weather is. The base is made heavier by adding sand or water to keep it stable and withstand your forceful shots. Wheels have been added for convenient transporting. This allows you to carry it off for some alone practice before the Sunday showdown with the gang. If you’re a bit of a more serious player then this one is worth a further look! 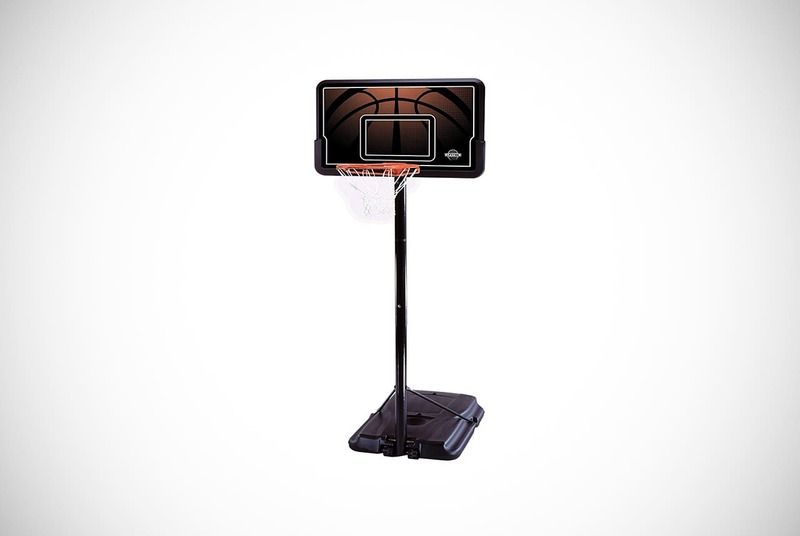 These amazing portable basketball hoops from Lifetime make us continue to love the brand. Offering an adjustable 10-foot hoop, this is for serious players. The features this model has made it a favorite among the Men’s Crew staff. Apparently, Rob from catering has hops, who knew? Anyway, back to the only Lifetime men care about. You can pick one of these UV-protected basketball hoops in either a black and orange design as well as black and red aesthetics. The 44-inch backboard is made of high-density polyethylene for impeccable strength and amazing durability. The round pole connects all the main aspects of the product in three reliable pieces. This enables the telescoping system to adjust the basketball hoop between heights of 7.5 and 10 feet. It also includes an all-weather net attached to a classic rim. These portable basketball hoops are lightweight, durable, and great for the price. Plus, it includes the standard Lifetime 5-year warranty! This model also has a base at a 27-gallon capacity, completed by wheels for easy transporting. Lifetime has claimed this base is really easy to fill. However, many of their previous customers have been a little frustrated at the size of the holes and the time it takes to fill it up. Picking One Should Be A Layup For You! What’s that? The referee spots a foul and points for a free throw! It’s time for you to step up and take a shot. Who’re you going to throw your money to? Did you miss? Get the rebound and head for the layup that is guaranteed to get the win as the clock expires! We’ve shown you some quality adjustable and portable basketball hoops that you can take anywhere you want. You’ve seen products from the likes of Spalding, Lifetime, and other impressive brands. Unfortunately, we don’t go into overtime here. We believe these portable basketball hoops are the ten best options on the market today. Remember our earlier advice and consider our key points before making your shortlist or final decision. Thanks for sticking around and we hope to show you more fun and cool gear on one of our buyer guides in the near future. To be the king of camping, you need a portable chair that matches your splendor. 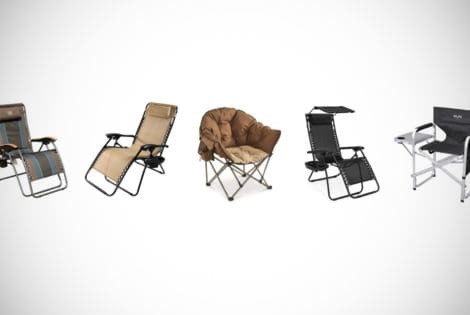 These 21 camping chairs are the best on the market, with a perfect chair to suit every possible need. 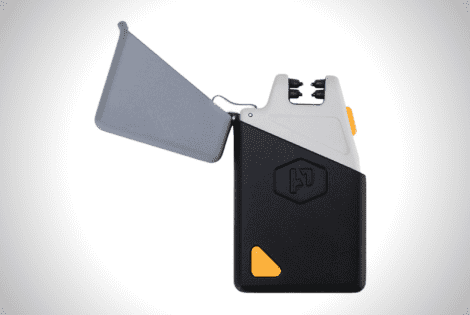 The Sparkr Mini Plasma Lighter 2.0 is a fuel-free lighter that works on an electric charge. It is windproof, flameless, and uses plasma to light a fire.